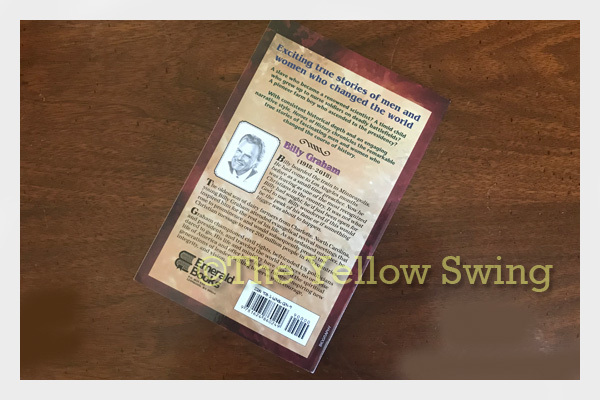 We had the opportunity to review a physical copy of Heroes of History-Billy Graham and its study guide, which is from the Heroes of History series published by YWAM Publishing. Over the years as members of the Homeschool Review Crew, my family has been introduced to a number of companies and products of which I knew nothing about; companies and products I was familiar with and companies and products I thought I already knew about. YWAM is one of those companies I was familiar with and thought I already knew about what it offers. I just thought the company published biographies. After having the opportunity to review one of its Heroes of History books, I realized it not only publish biographies, but also has curriculum built around the books it publishes. YWAM also carry many other products that would be of interest to homeschoolers. We have become great fans of YWAM. One of Lily’s favorite YWAM books is Christian Heroes- Amy Carmichael. You should read the amazing story about Carmichael, an Irish woman, who followed God’s lead to become a missionary in India. She rescued children from sexual and parental abuse and later opened an orphanage for girls and eventually, boys and girls. Last year while at a homeschool convention, my daughter selected several books from both of the YWAM Christian Heroes and Heroes of History series, which I purchased. Unfortunately, the vendor was sold out of Heroes of History-Billy Graham. Of course, it was one of the biographies she was excited about reading. So, when I saw Billy Graham’s biography was one of the books being reviewed by the Homeschool Review Crew, I was happy to learn we were chosen to review the book. I think God was preparing him to share (i.e. selling in a positive way) the gospel with Graham’s early days as a Fuller Brush man. Billy’s courtship with Ruth Bell. She was not quick to accept his proposal, because she had a goal to become a missionary in Tibet. He did not pressure her to marry him. During that time of waiting, I believe God was preparing them both for their missions; Billy as an evangelist and Ruth as the caregiver of their children and home. In 1954, Graham’s crusades were well attended, but still segregated. I was impressed with Graham’s insistence his crusades be integrated. Graham’s views on race relations were not the norm during those years. He could have easily chosen to continue preaching and ignoring events happening during that time, but I think he was directed by God to take a stance. As an advisor to the presidents, Graham was also instrumental in Eisenhower sending federal troops to Little Rock, so school integration would be inforced. Author Janet and Geoff Benge do a wonder job with the YWAM series books they write. The Benges stories include so much history of the lives of the people of which they are writing. The way they tell the stories allow you to comfortably use as read-alouds for the entire family without skipping important historical events in their lives. The study guide is available to purchase as a download, but is not required to read and understand the book or to enjoy the history shared in the stories. The study guide allows you to turn the learning experience into more than just a book read, having the study is very helpful. The study works like a unit study with art; creative writing; drama; essay writing; geography; public speaking and reading comprehension with the activities included on the guide. Something I like about the exercises in the study guide are that it is geared toward that student who is working alone and may not have a classroom of peers with which to complete projects. The activities can be easily adapted for more than one student. We just enjoy the YWAM books for history reads. The books work well as read-alouds for all ages, but could also be used by a middle to high school student as independent history and literature study read. I really wish I had introduced Lily to Billy Graham before his passing. She has watched several biographies about Graham and read other pieces. I love that the book was reprinted in 2018 to take readers through Graham’s life until his death. He was an amazing man! YWAM books are good reads, inspirational stories about amazing people who overcame challenging obstacles and achieved success (living a fulfilled Christian life) and ones to help you promote your Christian faith with your children and others. YWAM is a non-profit organization and much of the money it receives from your purchase goes back into the mission field, supporting people internationally. 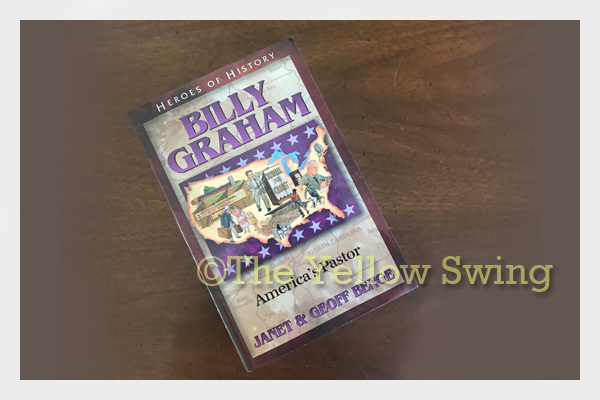 Heroes of History-Billy Graham is available as a physical copy for $7.50. The stories (and lessons learned) are worth the price. Book bundles are also available for each series. You may also purchase a downloadable version of the study guide.